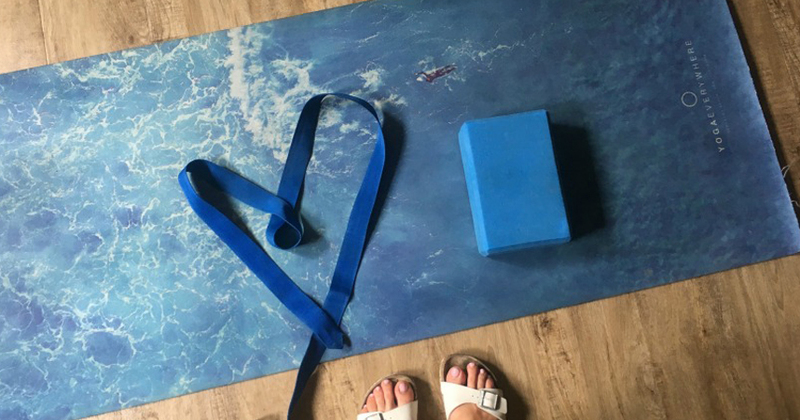 Motivating yourself to practice yoga at home can be quite the hard hog. For a lot of us, yoga classes are a luxury; time to zone out from the day and tune in to our bodies. We get into a routine of classes and teachers we like but sometimes we can’t quite make that routine stick. When work (or life!) gets busy, when you travel or when you can’t justify the cost of a studio visit, the best option is to practice at home. Sure, it can be easy to make excuses not to practice when you don’t have a full studio setup, a teacher or props on hand. We want you to think outside the box and make yoga without props work for you. This is the Power Living guide on how to do yoga without props to get you moving – no excuses! Look around you. There are so many everyday, household items that can substitute props. When it comes to blocks, you may need a few items for different postures. If you’re after a little boost, grab a book (or a stack of books). Books are great for a bit of extra height – just be careful if resting your hands down (like in upward facing dog!). Need a bigger lift? Grab a small rubbish bin and turn it upside down (don’t forget to empty it first!). No strap? Not even a problem. Yoga straps are an amazing tool for the less flexible yogis out there. While studios offer straps with buckles, there’s a few easy DIY options you can substitute! All you need is a long, non-stretch piece of fabric. Head to your wardrobe and grab a belt (leather or cloth) or a tie. Alternatively, try a kitchen towel if you only need a short strap. If you’re travelling, grab the sash from your hotel bathrobe! No bolster? Not a bother. If you’re looking for a restorative home practice, having some extra cushioning will always help you to relax. While you might not have a circular bolster on hand, a quick fix could be rolling up a couple of blankets or towels. If you need a little bit more padding, grab a pillow off your bed or a cushion from the couch – you’ll be blissed out in no time. Fully equipped and still not sure where to start? We’ve got your back. Check out YOGAHOLICS for all the instructions you need. You can practice yoga from the comfort of your own house (or hotel room, or the park!). Grab your mat and give those prop swaps a go!